This is a photo of one of the two known Shaker counters on which I based my counter in the June 2012 issue of Popular Woodworking Magazine. As I looked at the photo, I concluded that it surely wasn’t a maple top as was the balance of the counter. No, this top looked more cherry-like in color. When the two parts were complete, and the top married with the base, I felt ill. The combination was so far from what I saw in my mind’s eye, I wondered if I needed stronger glasses. It would not work. I had to change the top’s color or wood. I chose color because it was much more work to change the wood. Or so I thought. First thing to do was to strip the top of its dark antique Sheraton dye. Pull out my #80 scraper and get busy. To my surprise, the top was clean in a short time, but I had to completely sand the surface a second time. With that complete, what would be the best look for the top. 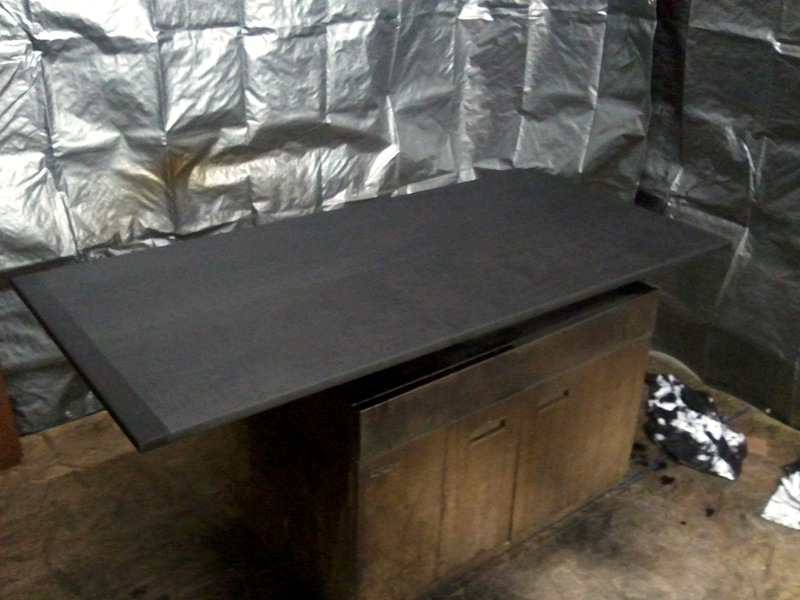 I looked again at the antique counter and began to see the top as if it may be ebonized. My top was cherry, and cherry is one of the better choices when ebonizing. Sounded like a plan. I knew that using only ebony aniline dye would leave my top with a bluish cast. That’s not good. 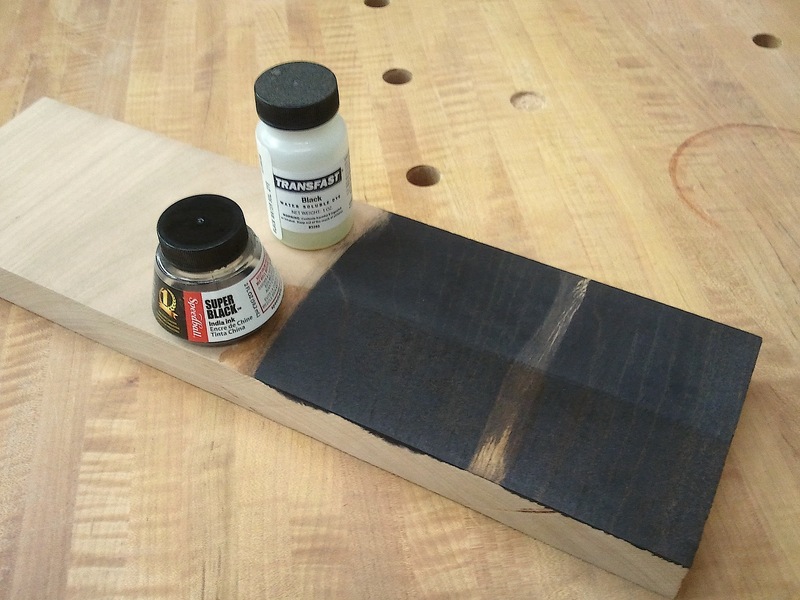 I went back and again read Brian Boggs’ article on ebonizing a finish (June 2009), but that procedure, even though the results are extremely nice, is too involved for my liking. I needed something easier. I thought back to when contributing editor, Christopher Schwarz built one of his many benches and needed to fill in some larger cracks in his top. He used a two-part epoxy colored with India ink. Why not mix some ink in with my dye to see if I could move from blue to black. I decided to use one part ink with 10 parts dye – I figured a 10% solution would be good to start. I didn’t want to simply ink the top. My results were, at least to my eye, better than the dye itself. 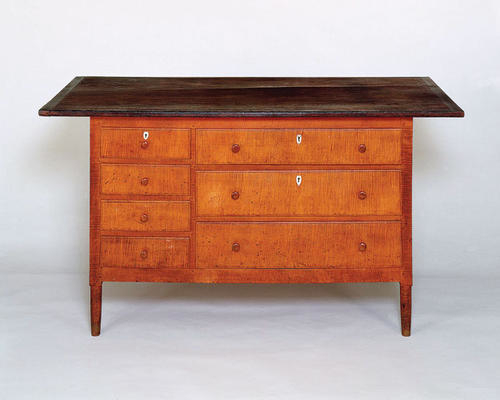 One coat on the cherry added a great deal of color, but still allowed the cherry grain – and the slight reddish hue – to show through. I am very satisfied with the finished appearance of my top, and equally happy with the combination of the ebonized top perched on the “popping” tiger maple. Take a look for yourself – pick up a copy of the magazine. Kind of reminds me of a sign I had hanging on my wall when I was in high school (a long, long time ago……). It said “PLAN AHEAD”, only the letters kept getting smaller and squeezed together, for lack of adequate space. Perhaps you should make one to hang on your shop wall, Glen. By the way, love the mallet.